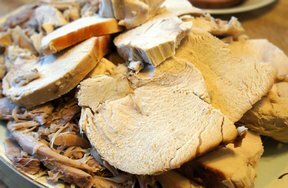 Remove giblets from the turkey and rinse the turkey inside and out. Pat dry with a paper towel. Place turkey on a roasting rack inside a large roasting pan, breast side up. Salt and pepper both the inside and outside of the bird. In a small bowl, combine the butter with 2 tablespoons of rosemary and 2 tablespoons of thyme. 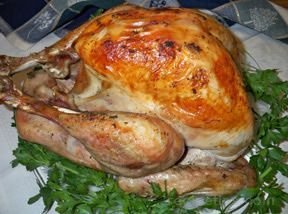 Slide your fingers between the skin and the breast meat of the turkey and gently lift up the skin to form a "pocket". Go as far up the breast as possible. Using your fingers, spread the butter mixture into the pocket all around the breast meat. If you have any left over, rub it on the outside of the skin, all over the bird. Place quartered apple, onion, garlic, rosemary and thyme sprigs inside the cavity of the turkey. Using kitchen twine, tie the legs together for roasting. 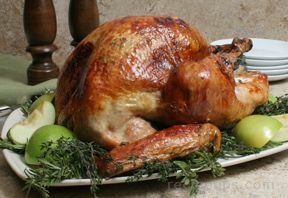 Pour the apple juice and water into the bottom of the roaster and place the turkey into the oven. The turkey will need to roast for 3 to 3 1/2 hours. You can baste the turkey with the juices in the bottom of the pan. Try not to overdo this as opening the door to the oven will require longer roasting time. 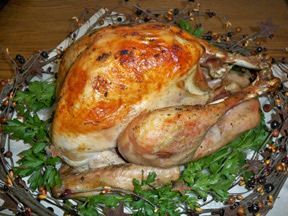 If the turkey is getting too brown, place an aluminum foil tent over the bird and continue roasting. When the turkey is done, remove from the oven and allow it to rest for 20 minutes before carving. "This turkey was so delicious and juicy! The butter under the skin and the apples cooked in the cavity gave it such a good flavor. This is one turkey recipe that I will keep for sure."